As Canadians, we can sympathize with Londoners. They too have incredibly cold winters and lead busy lives. We can also learn a thing or two about architecture from them too. This massive home has five bedrooms and two bathrooms as well as an open plan ground floor, including a kitchen, dining room and living room. It also features a garage and a study. 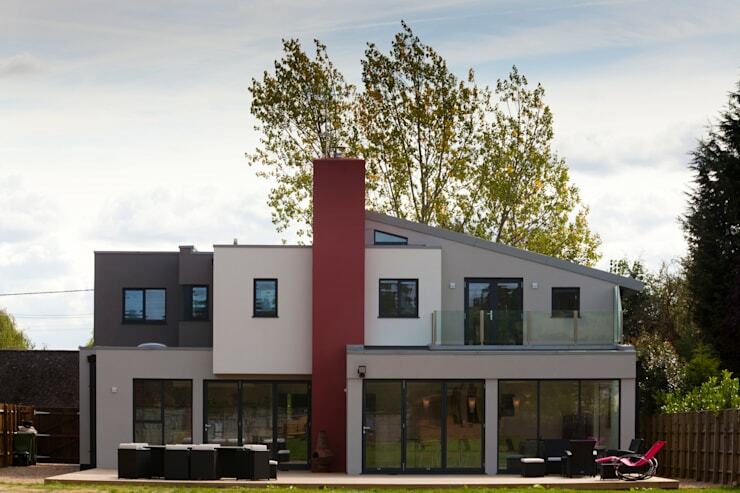 Designed by professionals Frost Architects LTD, what is most striking about this home is its modern composition, eclectic flair and its use of steel and glass. It is also low in energy with a high thermal performance. From the front of the home, we can see how contemporary and stylish it is. The designers have played with shapes, volumes and height to create a unique effect where it looks like boxes are piled on top of one another. 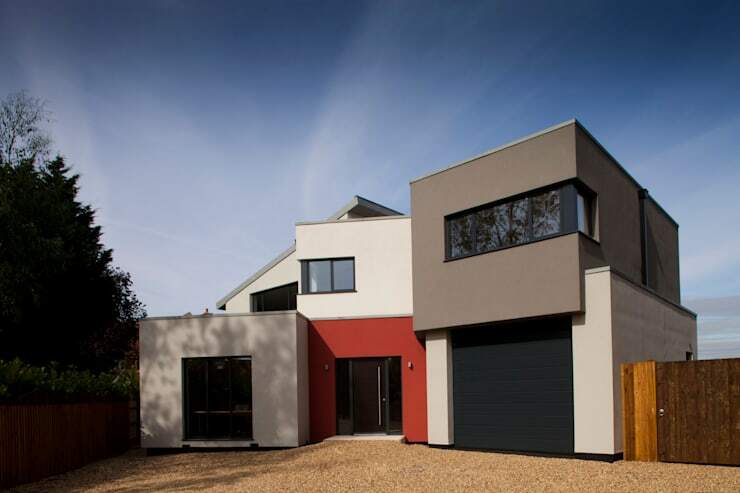 The different shades of the facade, including red, light grey, dark grey and black, make for a very striking design. Do you see how one bright colour can be so effective when combined with more neutral colours? The garage neatly stores cars, bicycles and other items neatly away while the front entrance is welcoming and warm. The entrance hall is like the business card of your home. It should delight and evoke intrigue. In this entrance hall, the designers have hit the nail on the head. In direct contrast to the exterior space, the interior features soft, white tones with simple wooden furniture. The look and feel is very classic and grand. This is enhanced by the voluminous stairwell and the beautiful piano that decorates this space. A simple mirror and a chest decorate this area too, adding to the charm in a very simple and effective way. 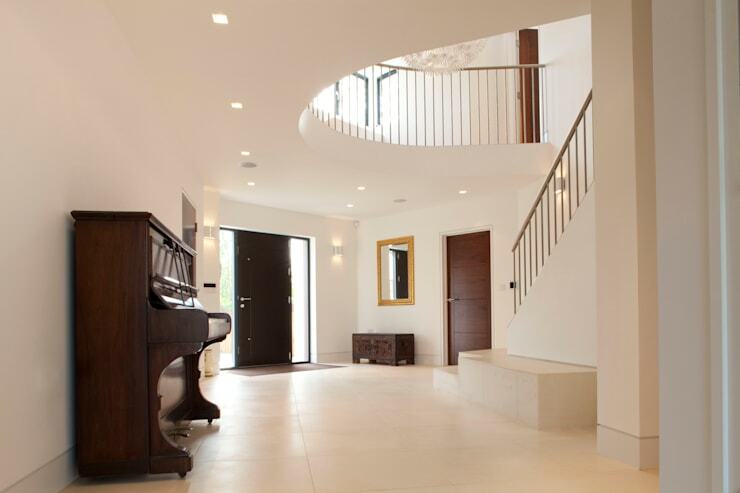 Have a look at these tips for making a great impression with your entrance hall of inspiration for your own home. The grey and white tones work in harmony in this space, creating an area that is edgy and clean. 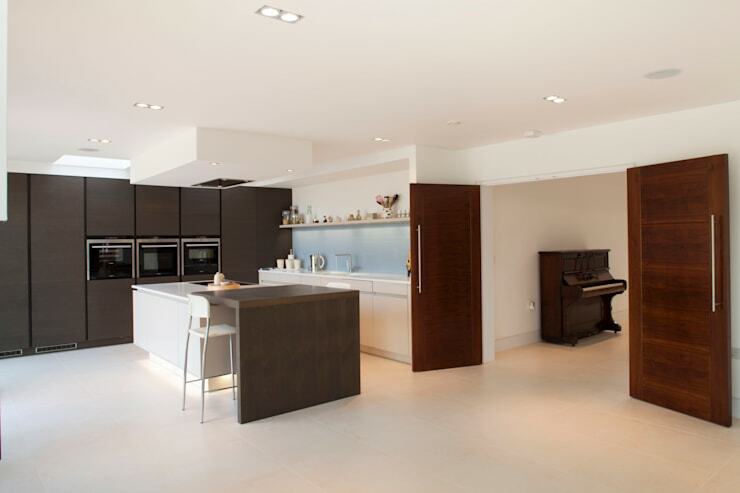 You'll also notice that there is ample storage space in this area, including shelves, cupboards and drawers. This keeps utensils, crockery and cutlery stored neatly away yet easily accessible. An organized space makes for an organized mind! The living room and dining room flow into one another with a very simple, minimalist look and feel. A grey sofa and coffee table make up the living room while a table, chairs and three drop down lamps make up the dining room. However the designers have found ways to integrate function and style. The cushions on the sofa, for example, bring colour and charm to the room while the lime green dining room chairs are trendy and funky. Don't you love the beautiful piece of artwork on the wall, which has been carefully selected for this space? 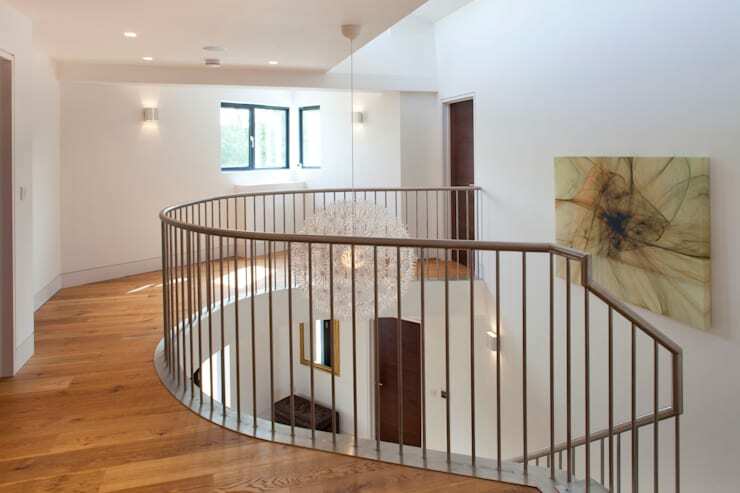 If we head up the gorgeous stairs that we saw in the entrance hall, we come across the mezzanine level of the home. It features wooden floors, which make for a very warm and cozy environment. The lamp chosen to hang in the stairwell is another example of design and functionality coming together. This funky lamp is as trendy as it is beautiful. Another simple piece of artwork decorates this area, giving us a glimpse into the personality of the home owner. We end off our tour in the backyard of the home where large glass windows and doors allow the home to spill out onto a spacious terrace. Furnished with comfortable chairs, this is the perfect area for relaxing in the sunshine and fresh air. 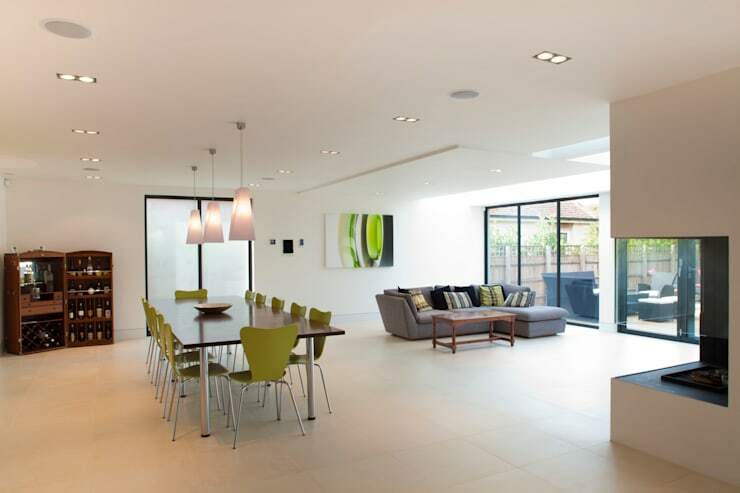 From this angle, we really get a sense of how big the home is as well as how the designers have created a beautiful connection between the interior and exterior spaces. Don't you love the little balcony on the top floor? Red plays a role on this side of the home too, enhancing the gorgeous facade.